I love to cook, but don’t have as much time to do it as I used to. That’s why when I can figure out a great short cut in the kitchen, but still serve a yummy, healthy dinner I am happy camper. 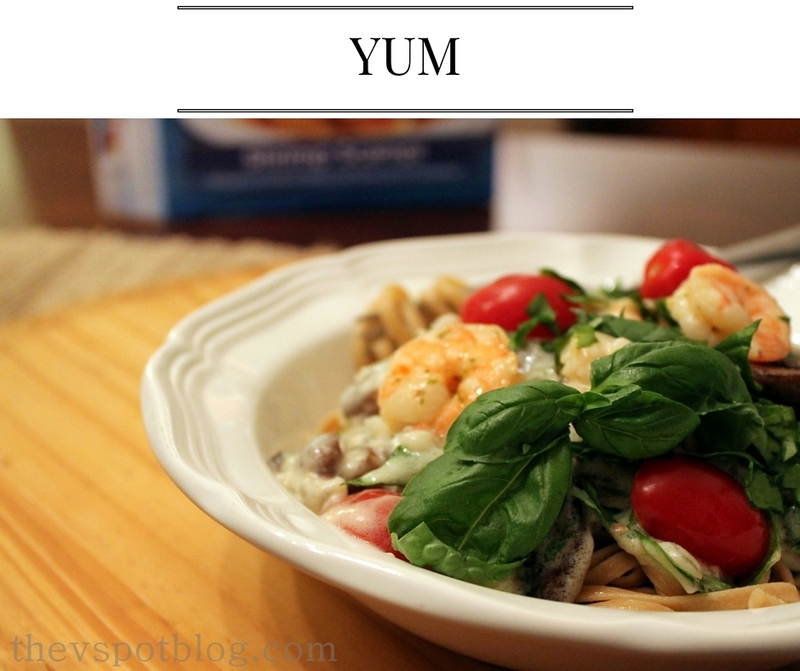 I was able to put together a delicious Garlic Shrimp Scampi Pasta dish in the time it took the pasta to cook! Love! 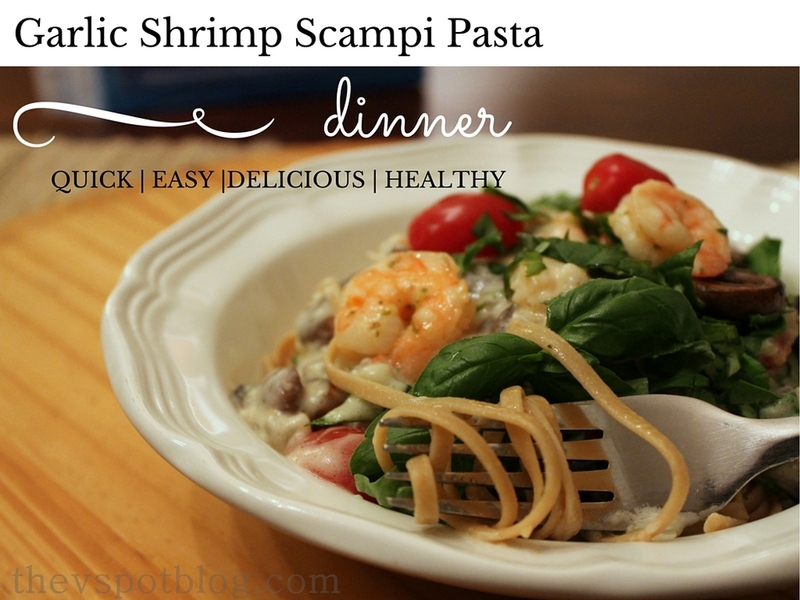 With whole wheat pasta, fresh spinach, tomatoes, mushrooms and basil and a yummy sauce this was good on its own, but adding SeaPak Shrimp & Seafood Company’s Shrimp Scampi to this dish made it a really great meal that my family loved. And it was such a time saver! Start the process to cook the pasta of your choosing. In the time it takes to boil the water and cook the pasta, your sauce can be prepared and ready to eat. One of the things I really like about this recipe is that I can incorporate lots of fresh produce, and that it’s a pretty easy dish to modify. 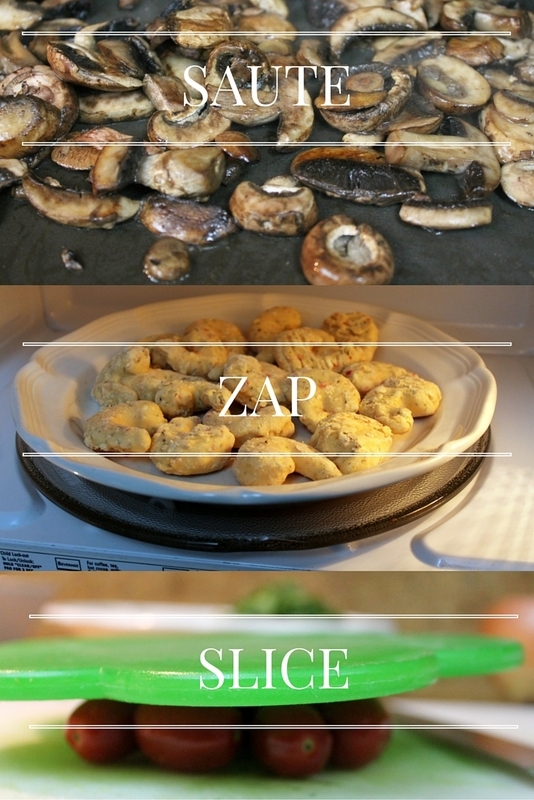 Hate spinach but love broccoli? Go for it. 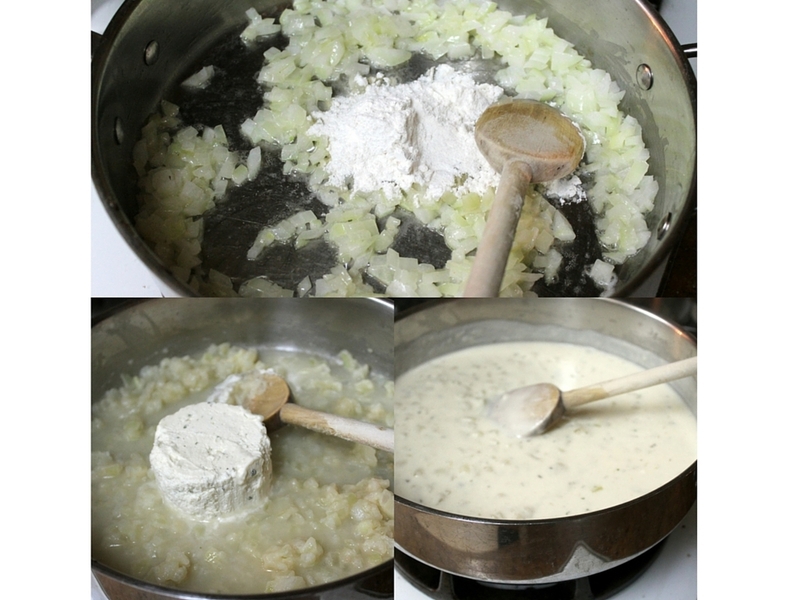 Whatever you want to add or leave out is easy enough, but no matter what you should start with a basic roux. Start by melting about 2.5 Tablespoons of the butter in a large skillet and saute the diced onion until soft, about 3 minutes. Add in the flour and stir until well combined. All of the flour should be coating the onion and it should form kind of a paste. Add a little of the chicken stock and the herbed cheese and stir until melted. Add the remaining chicken stock and simmer. While the sauce simmers, melt the remaining butter on a griddle or large skillet and place the mushrooms in a single layer over medium high heat. Sprinkle with salt and let cook for about 6 minutes, stirring only a few times. You want to let them caramelize a little bit. While the mushrooms are on the griddle, follow the package directions to cook the SeaPak Shrimp Scampi in the microwave and begin prepping the fresh produce. Have you seen this great trick for slicing cherry or grape tomatoes? Such a time saver! Lightly place a cutting board (or a plastic lid) on top of the tomatoes, apply light pressure to hold them in place and slice in half horizontally with a sharp knife. Chop the spinach and fresh basil. When you remove the Shrimp Scampi from the microwave, you’ll notice that the cooked shrimp are now in a lovely, garlicky sauce. Using tongs, add the shrimp to the sauce in your skillet, but pour the garlic sauce from the microwave over your drained pasta and toss to coat. Add the freshly chopped produce and the mushrooms to the shrimp skillet and stir to combine. Serve immediately over the pasta. We are all trying to eat a little healthier, and the USDA recommends we eat at least 2 servings of seafood a week. SeaPak has made it a little easier to do this with their convenient and yummy products. Love seafood? Enter SeaPak’s Seafood Sweepstakes for your chance to win a trip to NYC for a culinary lesson with Food Network Kitchens! Linguine with Clam Sauce – A family favorite. The best lasagna recipe. Ever. Cowboy Tacos: a spicy sweet pork taco recipe.